When you approach the southern end of the Las Vegas Strip, you will encounter a fortress. Above all, this is where Excalibur Hotel and Casino is. The hotel is a medieval emblem. But you know what! It stays to date. Many people describe the hotel as the sexiest and sinful playground for adults. How accurate are these allegations? Well, no one can confirm whether they are. The fact is here; children find the hotel conducive. Many of them come here with their parents, and they have fun. While there is a section that calls the resort sinful, there is another group. The latter considers Excalibur Hotel and Casino the best. They call one of the kid-friendliest hotels in the southern Strip. The architectural design of the hotel is properly done. The designer should receive praise. In its entirety, the resort has a total of 3, 981 rooms. When you enter the hotel, you will realize that there are expensive chandeliers. They adorn the entrance as you enter. The window glasses are thought, a sign that the operator needs quality. Those who attend to visitors are not in any way simple. They do not complicate things either. You will not see all employees in a particular uniform. But there is a small section, staffers that wear sports coats and ties. The location of the resort is ideal. It is a good place for those that want to explore the Strip. 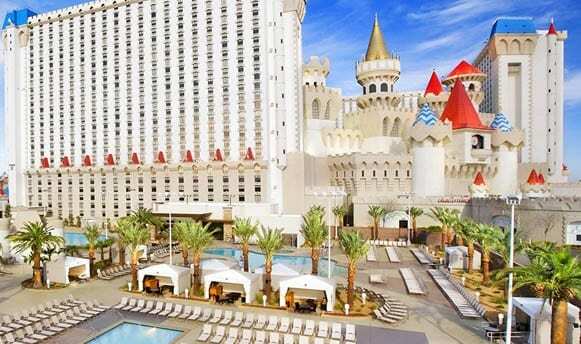 Very few resorts in the south have a well-arranged house like the Excalibur Hotel and Casino. Accessing the hotel is one of the easiest things around. Almost all facilities at the Strip are an only 15-minute drive away from the airport. Excalibur is one of these casinos. What is more, several cabs run up and down. Finding a taxi or a double-decker bus is possible. These services are available 24/7. Rooms at the facility are what you need. You will not complain one you are on the bed. Beddings are clean and big enough to accommodate up to three adults. Many rooms have a one king bed or two queen-size beds. Above all, this is so because the management wants all visitors to have a real value for their money. The interior décor varies from room to suite. But in general, you will not complain. The walls are done nicely. Inside most rooms, the floors have a beautiful carpet. Those that do not have to maintain the same level of cleanliness. Walls have big TV screens. Back on the beds, you will find blue or multicolor cushions. At the Excalibur Hotel and Casino, suites are different. For instance, there are Two-bedroom luxury suites. These rooms feature extras such as a wet bar and a deep soaking tub. There is nothing really to be proud of when it comes to the bathroom. Above all, this is because they are a bit out of date. Most of the suites come with old tiles on the floors. You can say the same with the showers. The good thing is that all rooms at the Excalibur Hotel and casino come with air conditions.